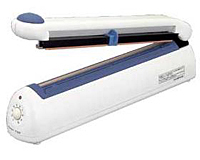 The P-Series is a poly bag sealer and one of the most easy-to-use hand sealers on the market. The P-Series, also known as the Poly Sealer®, is perfect for compact, tabletop use. The Poly Sealer® is an impulse sealer for sealing packaging only. Seals up to 1,000 bags daily; maximum bag size is up to 20/30 cm. The poly bag sealer is compatible with the following packaging materials (total thickness of two or more sheets): PE>0.2mm, PP>0.2mm, NY>0.1mm, PVA>0.1mm, other laminated materials>0.1mm. The four types of sealers bleep when finishing sealing. The Model P-200 and P-300 are easy-to-use, table-top type impulse sealer suitable for short-run packaging, and used even at shop front since it does not occupy much space. And it is the best for packaging parts etc., small quantity, even at packaging of sweets in a shop front, or a factory. Only depressing lever lightly is needed for strong sealing. The PC-200 and PC-300's cutter can trim the pouch above the seal to produce a neat clean package; it also allows you to make bags from roll polyethylene tubing.